i'm pretty much a sucker for anything black & gold - if you haven't noticed! 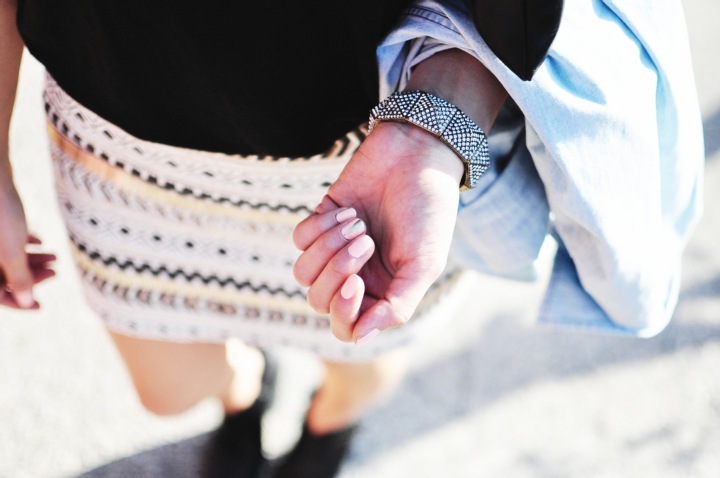 i love the detailing on this skirt. the beading (which isn't quite visible from my photos) and the rows of gold plates really adds a subtlety of bling to the skirt. i took a casual approach to it by pairing it with a simple tank, chambray and booties, but i can see myself dressing it up with some stilettos (preferably these ones). went perfect with this outfit! i try to do beauty posts here and there so i think i might just have to do a nail tutorial on this. it's super easy! but, i have some helpful tips. i'm not a beauty guru, but i do love makeup and anything beauty related, so if you have any beauty requests please let me know. i'll try my best to share my beauty knowledge. Love your skirt! I would only think to wear it at night for evenings out on the town but you were able to totally style it for daytime wear. I would like to request a beauty post on your recommendations on summer foundation. How do you keep your makeup looking fresh when it's gets hot outside? My always gets sticky or starts to melt off.